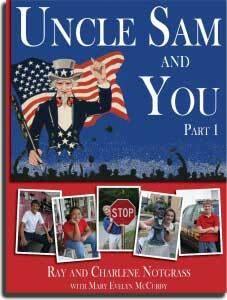 Uncle Sam and You is a Christian-based government and civics course for 5th to 8th grades. It is a one-year course. Exploring Government is a one-semester government course for students in grades 9 to 12. Can be used in homeschools, co-ops, and private schools. A separate teacher’s manual is not needed in Uncle Sam and You Parts 1 and 2 because the easy-to-follow daily instructions for how to use the course are included in the texts. It is designed for students to be able to work independently or you can work together. The texts include both modern and historical photographs and illustrations with full-color. Lessons typically take 45-90 minutes. Activities are varied and include the following. One special family activity is assigned each week that corresponds to the holiday lesson you choose. These activities include craft and art projects, themed meals, and other multi-age activities. From the Notgrass Company, the Uncle Sam and You Set includes one of each of the following books. Two optional books can help measure your student’s understanding of the material. Most parents choose one or the other for each child though you can use both for one student if you wish. Student Workbook Sold separately below for grades 5-6. Lesson Review Sold separately below for grades 7-8. Additional books are used with this course. They are available individually below. 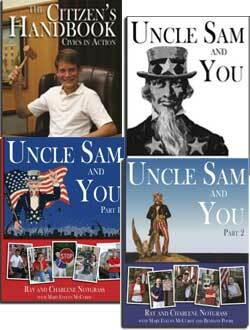 Uncle Sam and You Part 1 has fifteen units with 75 lessons about the American system of government and focuses on elections, the presidency, and Congress. It is suggested for use in the first semester. Celebrating America’s Patriotic holidays is an important part of civics. Fifteen of the 75 lessons in Part 1 are about those holidays. With 75 lessons, Uncle Sam and You Part 2 covers military and emergency workers, state and local government, the judicial system, and government involvement in transportation, tourism, and more. Fifteen of the 75 lessons in Part 2 are about those holidays. There is also an index to the curriculum. A collection of primary sources related to American government, politics, and civics, the Citizens Handbook has letters, memoirs, speeches, articles, songs, and poems. It also includes Virtue Stories about how Americans served and sacrificed for the benefit of others. View Sample Pages from the Citizen’s Handbook. Grades 5-8 Hardcover. Color and black and white illustrations. 183 pages. The Uncle Sam and You Answer Key includes answers to the end-of-lesson assignments, Student Workbook, and Lesson Review. 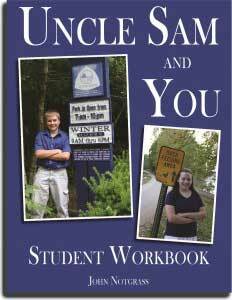 The Uncle Sam and You Student Workbook reviews and reinforces information from the daily lessons with crosswords, find-a-words, matching, drawing, and other handwork activities. View Sample Pages from the Student Workbook. Plastic coil binding. Consumable. 150 pages. Grades 5 and 6, suitable for older students with this learning style. The Uncle Sam and You Lesson Review has daily lesson review questions, literature review questions, and weekly quizzes. 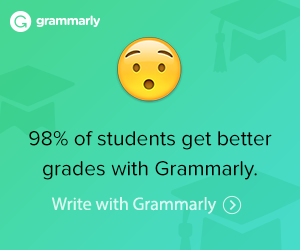 It is designed to help measure a student’s comprehension of the material. View Sample Pages from the Lesson Review. Plastic coil binding. Consumable. 94 pages. Grades 7 and 8, suitable for younger children with this learning style. Lincoln: A Photobiography is used in Units 5-6. 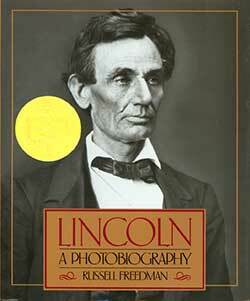 It is a Newbery Medal Book and tells the story of Abraham Lincoln with photographs and prints of his day. A Letter to Mrs. Roosevelt by C. Coco De Young is used in Units 10-11. Brighty of the Grand Canyon is used in Units 12-14. Brighty has many adventures in the Grand Canyon. He is a burro, not a horse. Basher Five-Two is used in Units 16-17. It is the true survival tale of an American Air Force Pilot who was shot down over Bosnia during a peacekeeping mission. The beloved story of the phantom horse on Assateague Island and the children who capture her, Misty of Chincoteague is used in Units 18-19 of the Uncle Sam and You Course. The Long Winter is used in Units 22-24. We like this particular edition because it has full-color illustrations by Garth Williams. It is a better quality paperback and well worth the extra two dollars. The Wright Brothers: How They Invented the Airplane is used in Units 25-26. In this Newbery Honor Book, you will read about the first powered, sustained, and controlled airplane flight and the men behind it. Lost on a Mountain in Maine is used in Units 29-30. In the mountains of Maine in 1939, a 12-year-old boy describes his nine-day struggle to survive after being separated from his companions in Lost on a Mountain in Maine.